KRASNODAR, Russia, October 10, 2013 (ENS) – Police from Russia’s Ministry of Internal Affairs today attempted to arrest the coordinator of Environmental Watch on the North Caucasus, after tapping his office phone. The environmental watchdog has been critical of damage done to Sochi National Park ahead of the Sochi 2014 Winter Olympics to be held February 7-23. This afternoon security officials attempted to enter the office of the Krasnodar regional department of the liberal, democratic Yabloko Party, saying they needed Andrey Rudomakha, the party’s regional representative and coordinator of Environmental Watch on the North Caucasus. Rudomakha was in the office today, but he left for business in another city, according to his staff. Office staff refused to let the police in because they did not have any of the documents required for carrying out operational investigative activities indoors. “The police have come for the leader of Environmental Watch, based on illegal tapping of his phone,” the staff said in a statement. FSB stands for the Federal Security Service of the Russian Federation, the principal security agency of the country and the main successor agency to the USSR’s Committee of State Security, the KGB. At around 2:45 pm the police left, declaring they would “soon return” with the necessary documents allowing them to come inside. The FSB investigation comes one day after Environmental Watch issued a statement and photographs showing damage done in Sochi National Park and the Caucasus Reserve by a road being built to connect the city of Sochi with “an exclusive mountain residence Lunnaya Polyana” believed to be for President Vladimir Putin. 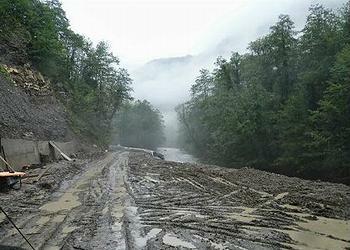 Several inspections conducted by the environmentalists, both before and after the torrential rains in the area in September, revealed “massive destruction of natural landscapes” in the Sochi National Park and the UNESCO World Heritage Site Western Caucasus. The project aims to widen and pave a narrow old 17 kilometer forest road, used by the Caucasus Reserve to access a ranger station inside the Caucasus Reserve, and to continue through pristine forest to a meteorological station which does not yet exist. According to official information published on the website zakupki.gov.ru, the government has already spent about two billion rubles on the road. Yet, recent inspections by environmentalaists show work on the project has stalled and a flash flood last month damaged work already done. Construction of the road through the World Heritage Site Western Caucasus has included cutting part of the mountainside, logging endangered species of plants such as the box tree, and mining rocks in the Shakhe River, which is considered a criminal offense in Russia, and crushing them into gravel for the road. “All along the road, construction equipment dumps oil and dirt into the river, a habitat for trout and a source of ground water for northern Sochi,” the group said in a statement Wednesday. To ensure construction goes through without any oversight, authorities have closed one of Russia’s most popular hiking routes, which connects the Fisht mountain to the Sochi coast. “Instead of doing their job protecting the environment, two rangers have been sent to guard the trail above the road construction to make sure no curious tourists see the destruction along the Shakhe River. The entire construction area is therefore off limits to the public, and EWNC was only able to reach it with great difficulty,” the group said. Environmental Watch has long been critical of what the Russian government is doing to Sochi National Park to make way for the Olympic Games. In August, the group made public an unannounced government decision to turn a primary oak forest in what was once part of the national park into a waste landfill. The group says Deputy Prime Minister Dmitry Kozak was responsible for the decision, which was made at what the environmentalists call “a secret meeting” on July 12 in Sochi. All key regional and local officials, heads of construction companies and Sochi Organizing Committee officials were there, but no representative of the public or of any environmental group was in the room. Environmental Watch on the North Caucasus says it will clarify what claims the FSB has against its leadership and will also investigate the basis for eavesdropping on its telephones. Environmental Watch was previously investigated thoroughly as part of the campaign against “foreign agents” when the Department of the Ministry of Justice of the Republic of Adygei came after them. The Republic of Adygeia is a Russian republic in the northern foothills of the Caucasus Mountains enclaved within Krasnodar Krai. Environmental Watch says it is constantly struggling to expose and halt environmental and legal violations, while various “law enforcement agencies” disrupt the organization’s work, doing everything possible to prevent its operations.